The mortgage crash of 2008 did a lot more than cause a recession. It created a long-lasting anti-financial institution mindset in a large chunk of America’s younger generation. This change in behavior has led to a gradual increase in the un- and under-banked throughout the US – a number now floating around the 15 million mark. As Millennials begins dominating the workforce, many employers are faced with the dilemma of finding ways to pay them. Where many in older generations enjoyed the benefits of direct deposit, a lack of bank accounts for younger workers has resulted in a surge of payments by check. However, a study from Workforce Institute at Kronos reported paychecks arrive late for about 15% of Americans and 25% of respondents reported regular receipt of incorrect payment. It is for exactly these reasons that many businesses have come to rely on the ability to direct pay employees. But, with the rise in un- and under-banked workers, employers are struggling to bring all of their employees into the digital payments fold. The solution for many? The paycards or payroll card. The idea behind use of paycards is simple. Employers have an electronic way to provide fast funds disbursement as well as an easy way to quickly resolve pay discrepancies. In return, employees have immediate access to their funds on payday, rather than having to take the time to deposit or cash a check. As an added benefit, most paycards utilize the rails of major card networks, allowing the cards to be used for debit transactions. But, just like checks, paycards are not all sunshine and rainbows. Similar to some bank accounts, there are many paycards that also issue fees to their cardholders. Some of the most popular fee-incurring situations include an ATM usage fee, card replacement fees and low balance fees. In some cases, there are additional charges for not using the card over a certain period of time. In short, they may “have their money” but they have a great deal of difficulty accessing it without loosing a chunk of their earnings to fees. Fortunately, there are several easy ways for businesses using payroll cards or paycards to help their employees avoid fees while better managing their funds. Promote Use of Surcharge-Free ATM Networks – Most major paycards are also members of one or more surcharge-free networks such as Allpoint, MoneyPass and CU Alliance. These networks provide nationwide cash access at participating ATMs. Employers can provide a link to the ATM the locator app and information for any network associated with their payroll cards as well as maps, flyers and other reminders to their employees paid via paycards. Encourage Financial Health – Employers can host workshops and knowledge sessions for paycards employees that help inform attendees about the steps to financial health and freedom including budgeting, investments and knowledge of the fees associated with their payroll cards…as well as ways to avoid them. On-Site ATMs – An ATM in the workplace provides safe, secure access to cash in a convenient location. The machine can be loaded with one of the surcharge-free networks associated with the paycard in use on-site, offering employees a fee-free way to access their funds – on payday or any day. Employees often need access to their money right away. However, without a bank account to initiate direct deposit, paycards are one of the only ways to ensure this convenience. Helping employees avoid these additional costs through education, information and on-site ATM programs not only encourages financial independence – it puts more money in the employee’s pockets. 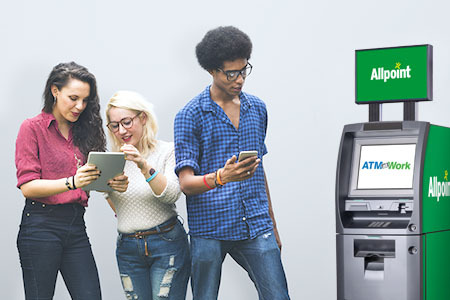 One of the hottest new benefits being offered by employers, having an ATM on-site saves employees time and money, keeps staff at work and provides a convenient and safe environment for employees to do their banking.